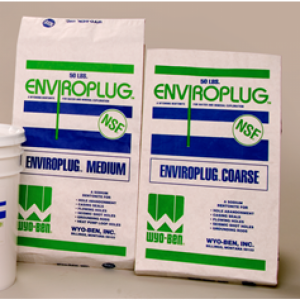 ENVIROPLUG® MEDIUM & COARSE were the FIRST bentonite chips developed and marketed. They are pure Wyoming Bentonite, designed for use as sealants for hole abandonment, casing seals or any vertical seal to prevent water movement up or down a bore hole. When absorbing water, ENVIROPLUG® MEDIUM & COARSE swell to fill voids, exerting pressure against all surfaces to create a flexible low permeability seal. Since ENVIROPLUG® MEDIUM & COARSE are introduced in a “dry” state, shrinkage cannot occur and there is a reserve expansion capacity. Generally hydration takes 1 to 2 hours.